Mashups have become very commonplace in music today. For those who aren't familiar with the term, a mashup is when two songs, typically two songs from very different genres, are mixed together to form a new song. And when done well, the song actually works beyond all odds. We are also seeing a lot of mashups on the world of T-shirts. Artists love creating graphics in which two different pop-culture icons are put together, often in a humorous way. In movies, we've long since seen films which are hybrids -- horror-comedies, romantic-comedies, etc. In these films, the blending of the genres seems organic. However, mashups can occur in movies too, when two water and oil genres clash. We get this sort of result in the bizarre Western Bone Tomahawk. Bone Tomahawk takes place in a small western frontier town, most likely sometime in the late 19th century. When a stranger (David Arquette) comes to town and acts peculiar, he's confronted by the Sheriff Hunt (Kurt Russell) and the stranger is injured. As the local doctor is drunk, Samantha O'Dwyer (Lili Simmons), is called in to help, much to the chagrin of her husband, Arthur (Patrick Wilson), who is bed-ridden with a broken leg. That night, two men are killed and Samantha and the stranger disappear. Hunt, his deputy, Chicory (Richard Jenkins), and local dandy, John Brooder (Matthew Fox) decide to go after them. Despite his injury, Arthur insists on joining them. What seems like a simply rescue mission soon turns into a battle for survival, as the men are threatened by bandits and then into a savage nightmare world. Everyone has that genre that they don't like and for me it's westerns. I'm not sure why. Maybe it's because, on the surface, they all seem exactly the same. Maybe it's because I'm not crazy about movies set in the past. Whatever the reason, I've never been partial to them or gone out of my way to watch one. Over the last half of the 20th century, apparently more people felt as I did, as the western waned in popularity. Still, it seems that at least once a year someone attempts to revive the genre and it also seems like Kurt Russell is in all of those movies. But, as noted above, Bone Tomahawk is different. Or at least some of it is. The first 2/3 of the movie play out like a fairly typical western, complete with cowboys, Native Americans, saloons, gunslingers, and the like. However, this part of the film does do something to set it apart from the westerns of the past. Writer/Director S. Craig Zahler, here making his directorial debut, has infused the dialogue with a wealth of life. It doesn't sound modern and hipster, but it is decidedly intelligent and informed, with each character having a moment where they say something very clever or come across as a wiseass. Either way, this isn't the standard western-speak and it definitely adds to what easily could have been an incredibly dull film, as most of the movie's mid-section deals with the posse roaming a wasteland. The other thing which sets Bone Tomahawk apart is the twist which appears in the final act. Not unlike The Descent or From Dusk Till Dawn, Bone Tomahawk takes a definite turn and becomes a different movie. Not completely different, but different enough. I don't want to give anything aware here, but what had been a fairly straight-forward western, with a bit of a mystery thrown in, as we don't know who took Samantha and the stranger, certainly turns into something else. I've read reviews which state that Bone Tomahawk becomes a horror film. I wouldn't go that far, but horrific things do happen. So horrific in fact that I know that some viewers have been very turned off by the violence in the finale, and question how Russell could appear in something like this. Yes, the movie does become violent, but it is necessary to illustrate the point which is being made. I liked that Bone Tomahawk was able to pump some life back into the western, but I can't say that I found the film to be completely satisfying. While it seems new and original at first, it was also very reminiscent of 2008's The Burrowers and it definitely owes a debt to The Descent. As noted above, the film does drag in the middle, and even the snappy dialogue can't shake the "are they ever going to get there?" feel of this film which runs over two hours. The ending is unflinching in its brutality, but it also feels very detached. There's no denying that for his first feature, Zahler has assembled a heck of a cast, and the movie has a very slick look. Bone Tomahawk is probably the best violent western that you are going to see this year, but don't eat before hand and don't expect it to re-invent the wheel. Bone Tomahawk does about as much with Sean Young as it can on Blu-ray Disc courtesy of RLJ Entertainment. The film has been letterboxed at 2.35:1 and the Disc contains an AVC 1080p HD transfer which runs at an average of 25 Mbps. The image is very sharp and clear, showing no overt grain or defects from the source materials. Given that a good portion of the film takes place in the bright desert, the lack of obvious visual issues is a compliment. The colors look good and the image is never overly dark or bright. The level of detail is notable and the depth is very impressive. The Disc carries a DTS-HD Master Audio 5.1 track which runs at 48 kHz and an average of 4.5 Mbps. The track provides clear dialogue and sound effects. The stereo and surround effects are very impressive, most notably during the second-half of the film. We get a true sense of sounds coming from the left and right, as well as the rear, placing us squarely in the action. The subwoofer effects come into play during the finale, adding a gross exclamation point to every blow. The Bone Tomahawk Blu-ray Disc contains a handful of extra features. 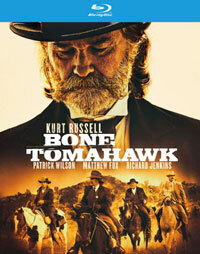 We begin with "The Making of Bone Tomahawk" (10 minutes) offers comments from Director S. Craig Zahler, as well as Russell, Wilson, Fox, and Jenkins. The piece focuses mainly on the characters and story, as the actors talk about how their counterparts perform in the film and how this influences the story. From there, we get a few minutes of on-set footage and some comments on what the production was like. The Disc contains one DELETED SCENE which runs about 3 minutes and is actually an extended ending. This doesn't change the ending, but it adds a nice epilogue. Kurt Russell is notably absent from the "Fantastic Fest Q&A with the Director and Cast" (35 minutes), but we still get some good information here. The extras are rounded out by a POSTER GALLERY and a THEATRICAL TRAILER.